Take a close look at a balanced, integrated model for teaching phonics skills directly and systematically. You'll get a firm grasp of the strategies necessary to provide appropriate teaching and intervention for each student. 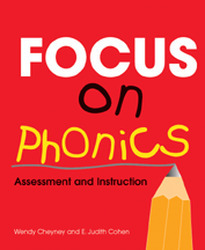 In addition to an in-depth discussion of the relevant research and philosophy, the authors provide detailed assessments and model lesson plans that focus on the components of phonological awareness, print awareness, synthetic and analytic phonics, and structural analysis. Put this highly successful approach for skills instruction to work in your classroom. 320 pages.